One of the most useful accessories for listing posts, in a blog, is the Archives retrieval gadget. Titled "Blog Archive" in "Add a Gadget", the archive gadget provides an automatically updated index of all blog posts, sequenced by date. It is an enhanced version of the first accessory for Blogger blogs, provided when the blog home page was previously no more than the most recent post. The original Blogger blog was no more than a sequence of posts, strung together, one post at a time. The "Archives" gadget, that replaced "10 Previous Posts", was provided to index the posts. Archives, unlike a label index or a linklist, requires no updating. Each post, as published, is automatically indexed by the Archives gadget. The gadget has 3 display modes. The most useful option in Archives, "Show Post Titles", only works in Hierarchy display - even though both it and "Show Oldest Posts First" appear to be offered for all 3 modes. 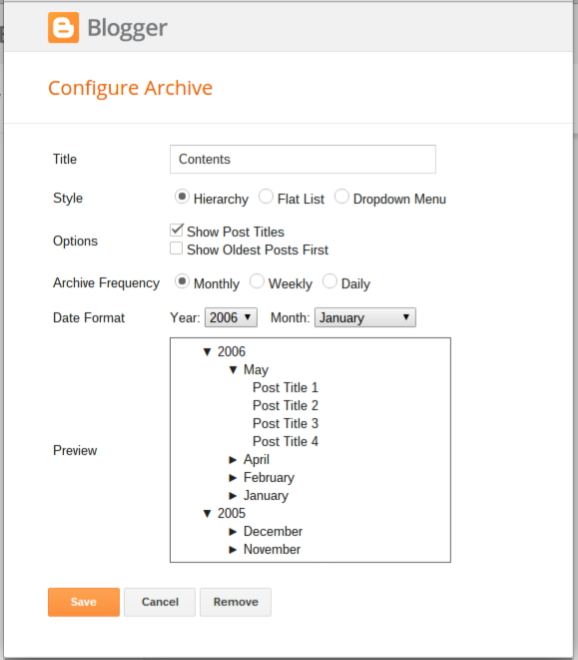 This blog displays Archives in Hierarchy mode, with "Show Post Titles" enabled. You'll see the Archives gadget, in this blog, halfway down the sidebar, and titled "Contents". Hierarchy mode, when displaying titles, opens to match page display date. In Hierarchy mode, and with "Show Post Titles" enabled, the Archives gadget automatically opens, with an expanded titles list, to match the date of the top post in the page. This makes it functionally similar to the classical "10 Previous Posts" accessory, from long ago. Right now, and with this post being the most recently published, the "Contents" gadget opens with an August 2015 title list. If you were to open my earlier post about making a static main page for the blog, you would see July 2015 open, in "Contents" - since that post was published in July 2015. The most recent post in "Home Page" (right now) is from July, 2015. Since my earlier post about making a static main page for the blog is (right now) the most current entry in the "Home Page" label set, a "Home Page" label search will open "Contents" to "July 2015", also. If I were to publish a new post to the "Home Page" label, that would change. Similar index page lists would produce differing results. Other options are available, to suit the blog. Other gadget options include the date grouping (monthly, weekly, or daily), and the date format (a variety of displays). These options appear to affect all display modes. And it appears to have 2 options, selectable for each mode. The 2 options only work in Hierarchy mode. 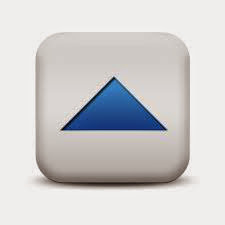 The date archives retrieval gadget is a useful component in a dynamic retrieval blog strategy. 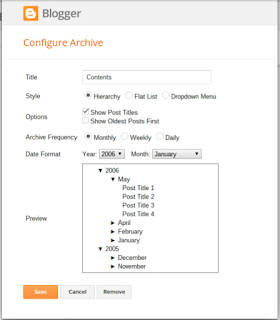 Owners of smaller blogs might complement the archives date index, with an archives title index. If you are seeing "Configure Text List", you added a "List". You need to select "Link List" ("Add a Gadget" above "List").